Fully automatic sprinkler controllers - dynamically creates watering schedules optimized for your plants. Smart Sprinkler Controllers Save up to 50% of your outdoor water use with advanced water saving technologies including weather forecasting and historical statistics. 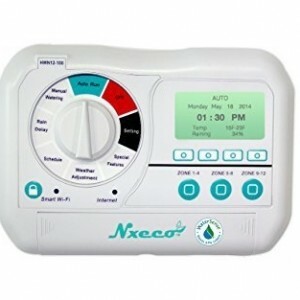 Controllers connects to WiFi and controls your sprinkler system anywhere. It can connect to WI-FI to access the B hyve app. It comes with weather sense technology. It has a water-resistant case and housing for the timer. It allows for integration with catch cups. It is compatible with Amazon Alexa. You will love this wifi sprinkler since it does most of the work for you to ensure your plants are well taken care of. First, you can control it remotely from an app on your phone as long as you have a wifi connection. It also works with a Weather Sense Technology to ensure your plants are provided with the right amount of water depending on the prevailing weather conditions. Saving water is also one of its strong points as you can easily integrate it with water catch cups. And if you would love to use it handsfree you will be happy to know that you can connect it to Amazon Alexa. However, it only works with a 2.5 Wifi router so you will need to upgrade if you want it to work for you. It is so easy to set up and you can set it up both indoors and outdoors. 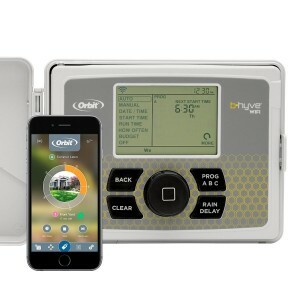 You can control it remotely by connecting to Wi-Fi to access the B hyve app that you can use to set the timer and use its smart weather programs. It has the weather sense technology which ensures that your plants are provided with the right amount of water depending on the weather which will help to save water when it is raining. You can set it outdoors without the fear of damage from exposure to wet weather since it is water resistant and the timer has a sturdy casing. It works with you to prevent water wastage since it can be integrated with water catch cups that help it to efficiently distribute water to your yard. You can set and control it using your voice since it is compatible with Amazon Alexa. You need a 2.5 GHz Wi-fi router for you to connect to it and control it remotely. It comes with dimensions of 9.2 x 1.5 x 5.5 inches with a weight of 2.5 pounds. It can connect to wifi to access the Rachio app. It is compatible with Amazon Alexa, Nest and Google Home. It comes with WaterSense Technology. It is designed with customizable schedules. One of the outstanding features of this sprinkler controller is that you can control it remotely which is quite ideal if you set it up outdoors. You can also use it with home automation systems that give you the ability to control it handsfree which is convenient. It can also be customised to water the plants according to the plant type or soil type to make them very healthy and it also saves you water when its rainy by cutting off the supply. However, its zoning schedules are quite complicated and you can only set up the zones from the website and not the app. It comes in small dimensions and its parts are easy to set up and install. You can control it remotely using the Rachio app as long as you have some Wi-Fi connection which is convenient if you set it up outdoors. It is compatible with most home automation systems which give you different ways of accessing it depending on your needs. You can customize its schedules depending on your soil type and the kind of plants you have to ensure they are watered adequately. It is capable of sensing the prevailing weather conditions like rain to save you water and when it's sunny to ensure the plants are properly watered. You can only set up its zones from its website and not from the mobile app. It zoning settings are quite complicated. It can connect to wifi so that you access the Netro app. It is designed with the capacity for customizable water schedules. It is powered by the use of micro-solar panels. It comes with Amazon Alexa and Google Home compatibility. It has the capacity to self-learn. There is simply no plant that you cannot use with this irrigation controller since it comes with a database of over 1,000 plant species that it can irrigate. It also comes with the ability to self-learn your preferences just from the settings you input into it to generate customized schedules for you. You will love that it is compatible with most home automation systems and it can be controlled remotely from an app. Ensuring your plants are watered accordingly depending on the weather and without wasting water is also one of its strong points. However, if your plants need to be watered for longer periods then you should be aware that its schedules only last for 60 minutes. You can use it with home automation systems. It is so easy to set up and install which can save you a lot of time in case you need to use it immediately. 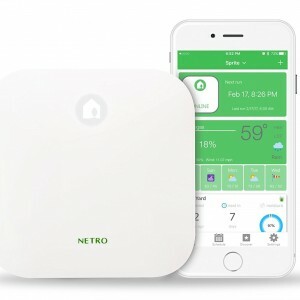 You can control it remotely since it has the capacity for Wi-Fi connection which enables you to access its controls from the Netro app. It can automatically sense the weather and ensure your plants are watered according to the prevailing weather conditions. You can customize its watering schedules so that your plants are watered according to your specific needs. It can help you customize the watering schedules since it collects data during operation to help you use settings that work best for you. You get to save on the cost of purchasing batteries since it comes fitted with micro-solar panels which generate power for it. It helps you comply with your local area water regulations once you feed it with the required settings. It limits the schedules to only 60 minutes at a time so you will have to constantly reset if your plants need more watering time. It comes with dimensions of 3.2 x 7.9 x 7.9 inches with a weight of 2.9 pounds. 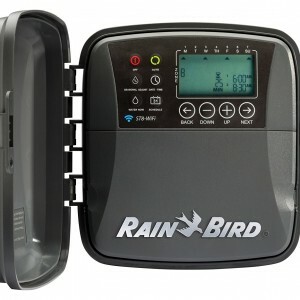 It connects to wi-fi and can be controlled using the Rain Bird App. It is fitted with a daily watering schedule and a watering delay feature. It is fitted with a control panel for adjustment of settings. It's watering zones last 199 minutes per schedule. It is compatible with a wired rain sensor. It is designed with a water-resistant cabinet. This Wi-Fi sprinkler controller we can go a long way in helping you conserve water and energy costs. 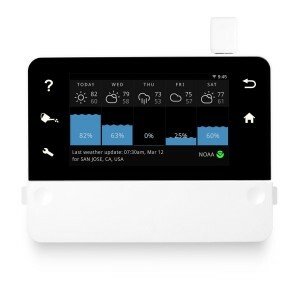 This is because it is compatible with a wired rain sensor that automatically shuts it off when it's raining so that you save on water. And it is powered by the use of batteries which do not take up much energy. You can also control it remotely through the use of an app downloaded on your phone which makes it very easy for you if you set it up outdoors. It also gives you the option to control it through the use of a control panel located on it. Another feature that makes it outstanding to me is the fact that it comes with a weather scheduling feature that helps you to water your plants according to the weather season to ensure that they grow up healthy. However, one drawback that this sprinkler controller comes with is the fact it is not easy to switch between zones seamlessly. You'll have an easy time setting it up since it comes with very simple parts. It is powered by the uses of batteries which conserves energy and save on electricity costs. You can control it remotely through the use of an application which means you can install it outdoors to set its timer right from your phone. It can be set to water the plants at specific times and delay the watering for up to 14 days which is ideal during the rainy season or for complying with local water regulations. You can set it to water the plants according to the weather conditions which helps in saving water. Its zone watering lengths lasts for over 199 minutes which ensures the plants are adequately watered. You can connect it to a wired rain sensor to conserve energy during rainy seasons by shutting off the pump valve. It saves your favorite settings in local memory so you do not need to reprogram it every time there is a power outage. You can use it outdoors since it comes with a sealed cabinet which is water resistant. Its app can be used to control a variety of timers making it ideal for watering different plants located in different parts of your yard. It is not programmed for a seamless switch from one zone to another and this can be time-consuming. It comes with dimensions of 5.9 x 4.5 x 1.1 inches with a weight of 11 ounces. It can connect to multiple weather data sources. Its programs can run individually or concurrently. It comes with rain and wind sensitivity. It comes with a touch interface with white LED illuminated touch keys. It is compatible with home automation systems like Alexa and nest. 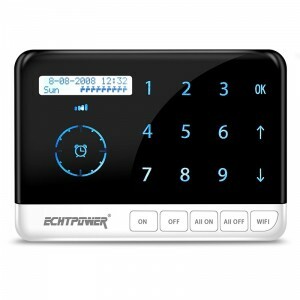 One outstanding feature of this Wi-Fi controller is the fact that it can connect with multiple weather data sources to ensure that it is up-to-date with the prevailing weather conditions in your surroundings. This is a fact that will enable it to adequately water your plans and ensure you get to save on water during rainy seasons. You'll also love it that you can connect it with home automation systems so that you have the ability to control it using just your voice which is convenient if you have a busy day. It is also designed in a way that it is sensitive to wind and water ensuring that your plants are properly watered in case of wind or when it is rainy. However, the only challenge that it comes with is the fact that it is designed with different user interfaces on its control panel, the phone application, and the web application and that means you need to learn how to use all of them for you to be efficient when using this device. You will love it that it's control panel is made of a touch interface that comes with illuminated touch keys which you can use when it is dark. It is easy to set-up and control which is quite time-saving. You will love it that it comes with a mechanism that is capable of preventing conflict between two schedules running at the same time. It is easy to set to water different kinds of plants since its programs can overlap to meet the individual water needs of different plant species. You can trust it to water your plants accordingly since it draws data from different weather data sources to ensure that your plants are watered according to the prevailing weather conditions. It saves you water during the rainy season since it comes with water sensitivity that will prevent it from watering your plants when there's already rain. You can use it on a hands-free basis by connecting roofs with home automation systems that will enable you to control it with your voice while you engage in other tasks. It comes with wi-fi capability which means that you can use it with your smartphone to control it remotely in case it's outdoors. You can trust it to supply adequate water to your plants even in windy conditions since it comes with wind sensitivities that ensure it can work against the wind when irrigating plants. It comes with the differently designed user interfaces for its control panel, phone application, and the web application, so you will need to master how each and every one of these interfaces work, for you to operate it properly. It comes with dimensions of 2.3 x 8.8 x 8.8 inches with a weight of 2.7 pounds. It collects weather data information from different stations and satellites. 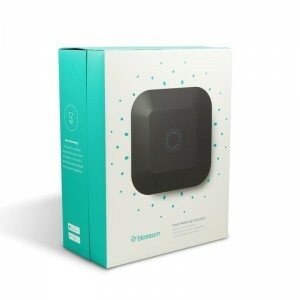 It comes with Wi-Fi capability and can be connected to the Blossom app. It can be programmed to work with over 12 zones. It is fitted with Powerline technology. It is designed according to the IP54 standards. It supports pump switch relay. You will love this smart sprinkler controller since you can program it to work with up to 12 different zones. Something else that you will enjoy is the fact that it comes with Wi-Fi capability which means you can control it from the comfort of your phone. And it is fitted with Power Line technology which is very instrumental when it comes to boosting the reach of your Wi-Fi meaning you can access it even if you set it far off the yard. Something else that is very outstanding about it is the fact that it supports power switch relay which will ensure that communication between your timer and the sprinkler is up to speed. However, one disadvantage that it comes with is the fact that you cannot schedule it to water the plants several times in a day or just water the plants at different times on different days. It also does not send out notifications when the sprinkler has been activated. It comes in very small sizeable dimensions and a very simple design that makes it easy to set up. You can connect to it via Wi-Fi to enable you to control it remotely from the comfort of your smartphone. It is very convenient for watering a large yard since it can be configured to work with up to 12 different zones. You can set it up outdoors without any fear of damage happening to it since it is designed to withstand water and dust. It can work with a pump switch relay to ensure efficient and fast communication between the timer and the sprinkler. You do not need to worry about your Wi-Fi’s reach since it comes with a technology that boosts the radius that your Wi-Fi can cover. It can connect to different weather data sources and satellites to get accurate information that it uses to ensure that your plants are watered appropriately. It cannot be programmed to schedule watering several times in a day and also allow for flexibility when it comes to picking specific times you need the plants to be watered. Its application does not send out notifications when the sprinkler has been activated. It comes with dimensions of 9.4 x 12.9 x 4.8 inches with a weight of 3.3 pounds. It comes with Wi-Fi capability which can cover a very long range. It can be programmed to work with up to 12 different zones. It is designed to work with a valet key in the absence of internet connectivity. It has the capacity to respond to weather conditions. It is compatible with most home automation systems. One of the key strengths that this sprinkler controller comes with is the fact that its wi-fi can cover a very long range. That means that you cannot only control it remotely but also control it when you are very far away from the controller itself which is a very great time saver. It can also be programmed to work with 12 different zones which give you an advantage of ensuring that your plants are watered sufficiently. You can also connect it to home automation systems to use it hands free. 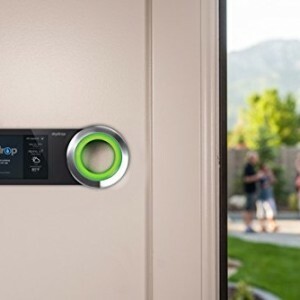 And it does not need to have an internet connection for it to work, so if you are away and there is somebody working in your yard they can easily connect to it using a valet key. However, the one disadvantage that it comes with is the fact that setting it up is not very easy since its instructions are not well laid out. It takes up very little space and it is easy to set up manually since it comes in very small dimensions. You will love that it comes with Wi-Fi that can cover a long-range therefore you will not have problems accessing it when you are very far in your yard. It does not need to access the internet for it to function and therefore if you have a landscaper working in your yard when you are away they can easily access it to water your plants appropriately. You can program it to work with 12 different zones which means that if you have partitioned your yard in such a way that there are different kinds of plant species in different areas they will receive water according to their specific needs. It works with data from weather stations and therefore your plants will be watered according to the prevailing weather conditions which will go a long way in limiting browning of certain parts of your yard due to insufficient watering. 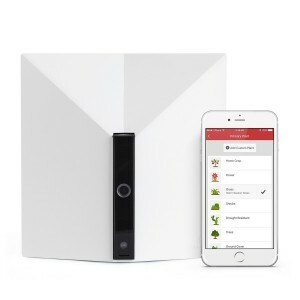 You can connect it to work with home automation systems which mean if you are busy and you want to use it hands-free you can easily voice out the instructions you wanted it to adhere to. It does not come with very easy to follow instructions and so setting it up and be very hectic. It comes with dimensions of 7.9 x 2.8 x 7.9 inches with a weight of 2.2 pounds. It has the capacity for wi-fi connectivity. It has the capacity to update its software automatically. It automatically stores all the data that it interacts with for future use. It is EPA WaterSense certified device. It comes with a built-in camera. 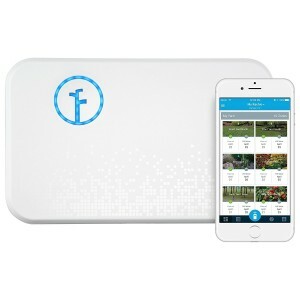 The fact that this smart sprinkler controller comes with an inbuilt front camera is a huge advantage since it is one feature that will enable you to monitor whether your front yard is being watered when you are away on a long trip. You can also connect it to your phone via Wi-Fi and adjusted settings and programs using the phone applications that it comes with to control it remotely. Since it is a smart sprinkler it will ensure that you also conserve water. However, one disadvantage it comes with is the fact that it is not yet compatible with some of the most popular home automation systems like Google home or Alexa which most people use. It comes with a smart controller that will go a long way in ensuring that you minimize wastage of water. You can monitor and control it right from your phone since it has Wi-Fi connectivity which works with an application that you download to your smartphone. It has a built-in camera that you can use to monitor your yard when you are away to ensure that it is being watered sufficiently. You can rest assured that it won't malfunction because of outdated software since it can update its software automatically without you kick-starting the process. It can work effectively even when there is no internet connection since it has a memory chip that stores all the weather data fed into it. You will love that it has the capacity to water your plants in accordance with the prevailing weather conditions to ensure that it saves on water during rainy days and supplies adequate water to the plants when it is hot and dry. It is also a smart sprinkler which means it is very efficient when it comes to preventing water wastage which can save you on potential fines from the local councils. It does not work with Google Home and Alexa as yet which are some of the most common home automation systems that are popular with most people. It comes with dimensions of 12.3 x 9.5 x 5 inches with a weight of 3.25 pounds. It comes with a waterproof housing. It is designed to work with local weather data that is connected to a self-regulating controller. It can generate water usage reports for your consumption. It is EPA WaterSense certified. One outstanding thing about this Wi-Fi controller is the fact that it comes with the ability to generate reports on your water consumption which you can review to ensure that you're using the right amount of water with no water wastage. It also has the ability to access local weather data and uses that to assist you in customizing the watering schedule. You have the option of either installing it indoors or outdoors without any worry of damage to it from dust and water since it is resistant to both elements. And if you would love to use it with home automation systems then you will be happy to know that it is compatible with most popular home automation systems. It comes with a user-friendly interface on both its mobile application and web applications which make it very easy to use. You will have an easy time setting it up since it comes with very simple parts which are easy to install. It is compatible with most home automation systems like Google home and Alexa which you can connect them to enable you to control it hands-free. You have the option of installing it indoors or outdoors since it comes with a waterproof casing that prevents it from water damage and dust invasion. It uses local water data to ensure that you can customize the watering of your plants to match the prevailing weather conditions. You will save on a lot of water costs since it comes with a self-regulating controller that will prevent any form of water wastage. You can access water usage reports that it generates to help you monitor how much water you use per every watering schedule. It comes with a jog wheel that has a wheel rotation which is made of seemingly cheap materials and that raises the question of durability especially if you lean more towards manual control. It comes with dimensions of 7.7 x 5.5 x 3.9 inches with a weight of 2.43 pounds. It connects to wi-fi and can be controlled using App. It comes with timer, also countdown and real-time controling. There is possibility automatically skip the watering schedule according to the local weather. Echtpower sprinkler controller works with the Alexa and Google Assistant for hands-free voice control. It comes with a LCD display. Echtpower Smart sprinkler controller comes with LCD display which shows the watering status, the date, and the local weather. Also sprinkler controller allows you to control different valves even outside of your house. Wi-Fi network ensures a more flexible schedule according to the local weather. Echtpower sprinkler controller working temperature is from 0 to 80 Celsius degree.